An Irish writer has made the shortlist of the Female Film Force competition. 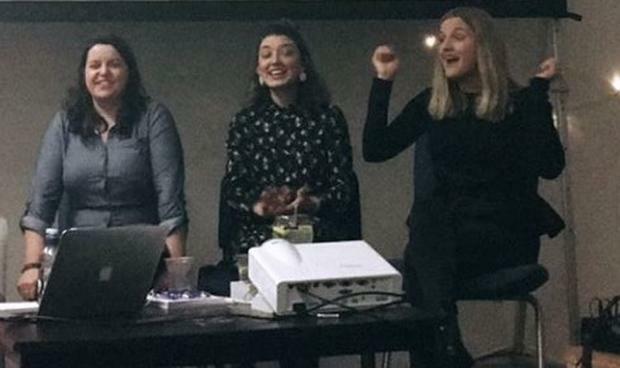 Emma Wall is one of ten female filmmakers who are in with a chance of bagging one of five spots in The Female Film Force where they will be fully funded to create their own short film. Dating app Bumble is behind the initiative which is offering grants of £20,000 and a chance to showcase their films in January 2019 to ambitious filmmakers across the UK and Ireland. Bumble received over 1,100 pitches and have whittled it down to just ten with Emma's period story about a family in a rural Irish village impressing the panel of judges. Other stories feature courageous young women fighting on the battlefields, fearless teenagers navigating womanhood, dystopian futures where women over the age of eighty are eradicated, and more. Broadcaster Edith Bowman and actresses Ophelia Lovibond and Georgina Campbell are on the panel of judges who will chose the successful final five. Louise Troen, VP International Marketing and Communications said, "We have been overwhelmed with the level of innovation and talent that these ideas have demonstrated thus far. "We have loved consulting with various formidable women across the film industry to decide on this shortlist, to invite to our pitch day at the end of July. We cannot wait to meet you all. You are incredible. You have made us laugh and cry, and we are so excited to help bring some of your film ideas to life." The final five will be announced early August, and will premiere their short films in January 2019 at an industry event. The Bumble Presents: The Female Film Force initiative was born out of the gender imbalance in the film industry. At the BAFTA Film Awards 2018 only 20% of the winners were female. At this year’s Oscars only 15% of recipients were women. Edith Bowman says, “The fight for Women to have equal rights and opportunities has to be taken seriously. The film industry has been in the spotlight for many months and although there has been a great deal of change and positive steps in the right direction, there is still a long way to go.